Although the wholesale revolution that occurred at the club and the beautiful game in general, when Arsène first arrived on these shores, was grounded in le Gaffer’s scientific approach to football, one of my greatest gripes in recent years has been my suspicion that his Excel spreadsheet style of management has been at the expense of the immeasurable, sixth sense means of assessing the less tangible aptitude of potential signings. We’re often reminded that vocal, demonstrative players, blessed with genuine leadership traits don’t exactly grow on trees nowadays. Yet it strikes me that one of the main reasons that the club has failed so abysmally to unearth any real captain material since the eras of Tony Adams, or Paddy Vieira, is down to Wenger’s inability to quantify such attributes, in the same way in which one might assess all the other stats that are indicative of a footballer’s specific talents. However, last summer, along with so many other Gooners, I wondered if we might’ve finally chanced upon the sort of dominant, alpha male character, with the necessary personality to provide our invertebrate Gunners with that crucial “never say die” backbone that we’ve lacked for so very long. Until seeing him play for Switzerland, frankly, I didn’t have a clue who Granit Xhaka was, or why he might be worth such a massive investment. Yet merely by dint of his woeful disciplinary record, mercifully it appeared as if this was a decidedly atypical Arsène signing, rather than another from le Prof’s production line of diminutive midfield ball-meisters. Perhaps it was merely wishful thinking, but at first glance of Granit in red & white, I was optimistic that this might be £35m well spent. Instead of the sideways and backwards ball playing tendencies of all those who are reluctant to take responsibility, could Xhaka be a Gerrard type player, who could singlehandedly grab a game by the scruff of the neck, with the sort of accurate long-range passing that would enable us to transition from one end of the pitch to the other, in an instant? If this was to be combined with the sort of imposing physical presence that I interpreted from his copious collection of red cards, then maybe, just maybe Arsène had unearthed the real deal, the missing piece in the jigsaw that we’ve been waiting to be completed for a decade or more. As the saying goes “it’s the hope that kills” and doubtless such lofty early season expectations have contributed to my subsequent trough of despondency and my inability to avoid what many others Gooners might claim to be an impatient “rush to judgement”. All the evidence I’ve seen since then suggests that Xhaka fails to fulfill the Ronseal promise and simply lacks the wherewithal to be able to “do what it says on the tin”. Enduring our customary Champions League implosion, during that devastating ten-minute second-half spell in the Allianz Arena the other night, I found myself wondering why on earth Wenger couldn’t have opted for an experienced player of Vidal’s calibre, seemingly bought by Bayern for less than he risked on Xhaka (not to mention importing a fellow Chilean who might’ve made Alexis feel more at home!). And as this campaign has ebbed, in the same lily-livered fashion of so many that have gone before, I find myself watching every other club, constantly comparing the likes of Kanté, Wanyama, Romeu etc. etc. and wondering if we’d have been better off buying them for less than the exorbitant sum that we’ve gambled on Granit. Kanté certainly can’t be classed as a DM and even at a mere £11m, Wanyama blows too hot and cold, but amongst a myriad of proven Premiership midfielders, in virtually every case, it’s impossible to avoid the conclusion that they might’ve brought far more to the Arsenal’s party, than a player who has yet to demonstrate absolute any evidence as to the sanity of his obscenely inflated value. Judging by the social media stick I’ve received, when I’ve dared to contemplate the likelihood of Xhaka being a costly mistake, it appears as if there are plenty of Gooners who view the 24-year old as our future midfield fulcrum. With each successive appearance, I’ve scrutinized Granit’s performance, believing that surely we must eventually witness the talent that convinced Wenger to focus on securing his signature, in preference to any of the other midfielders on the transfer merry-go-round last summer. Although some players take longer than others to acclimatize to the Premiership environment, with Xhaka coming from the Bundesliga, I’d have expected him to find his feet quicker than most. Yet as hard as I’ve tried to make allowances, to date we’ve seen nothing to suggest that he’s going to prove himself capable of cutting the proverbial mustard. As so many others have commented, one could forgive Granit’s far too frequent disciplinary indiscretions, if this was merely a consequence of him being a domineering player, who’s determined to impose his physical presence to control the middle of the park. Sadly, more often than not, the cause of Granit’s early baths seems to be a dismissal resulting from his inability to temper his reaction to being caught on the ball. Where’s the value in spending £35m on a player who’s tendency to lose himself amidst the red mist is likely to result in him spending a quarter of the season suspended? I sincerely hope Xhaka proves me wrong and that I’m left having to eat these words in the future, but from what I’ve gleaned thus far, I suspect he’s a player who might’ve shined in a less frenetic footballing environment. Yet in the pressure cooker climate of the Premiership, where most of the Arsenal’s opponents are intent on denying us any opportunity to develop some rhythm to our play, sadly Granit seems to lack the footballing brain, the composure and perhaps even sufficient talent to cope with a more “in yer face” version of the game. To my mind, the evidence of a genuine world-class midfielder has always been someone who could be surrounded by the opposition and yet who somehow has that magical ability to create both time and space on the ball, where none exists, to be able to pull something out of the bag. However I wasn’t expecting Xhaka to be a surrogate for Santi Cazorla, since I assumed we were buying a dedicated holding midfielder, a Gilberto-type unselfish water-carrier, who could offer that same “invisible wall” protection for our defence; with the added bonus of having in his locker the ability to play a bit and pop up with the occasional 30-yard screamer. Unfortunately, he’s certainly not proved to be the workaholic who creates a sufficiently watertight screen across the middle of the park to enable Wenger to omit the likes of Coquelin. Much like many who’ve gone before him, Xhaka appears to be a more costly Jack of all midfield trades, master of none. Myself I could easily forgive any such limitations, if Toblerone man possessed those all-important, gritty leadership traits, which were capable of forging a staunch team unit that refuses to lie down. 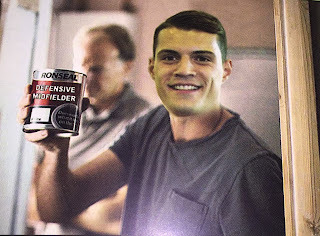 But then I can't ever recall Granit breaking sweat and as has been rightly pointed out to me, sadly he's more Flake than Toblerone! Would his ponderous tendencies prove less of a hindrance and could Xhaka flourish in the more circumspect climate of Champions League football? Sadly far from him being Granit by name and nature, as we’d all hoped, he showed the same timid personality of the majority of his team-mates, as we waved the white flag in Munich. 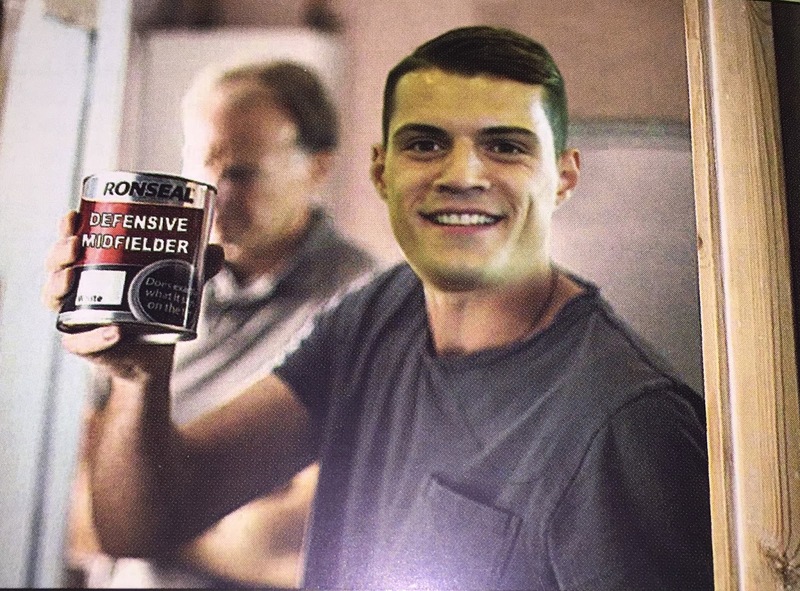 Much as with his Arsenal colleagues, perhaps it might take new management to lift the lid off and coax the real Granit Xhaka out of his mistakenly labeled and worryingly unimpressive tin? i enjoy reading your posts (although you could probably use 25% words to make the same point). is Xhaka a disappointment? It was a concern that he didn't slot into the team immediately having played well at the Euros, had a full pre-season and was without injury. Not sure thats all on him though (he hardly picks himself). What I will say he has joined Arsenal at a highly unusual time. Our playing style is all over the place. Wenger gambled on Santi and Ramsey being fit and as a result i don't think he' had a fair settlement period. He played well last night.I don't think he's as dumb as you believe and he is a fantastic distributor of the ball (much like Arteta). He'll never be box-to-box or an enforcer but through improving his positional play he could be something special. Unfortunately he joined Arsenal at a bad time and due to is price tag and the desire by many fans for the 'next Viera' he has been unfairly criticised. A very timely post, considering the debacle in London last night. Xhaka is just one part of a puzzle that Wenger has yet to assemble into a dominating team. Granit has not demonstrated the ability to be creative, like Carzola. However, paired with a more imaginative midfield partner, he might develop into a dependable presence in the Arsenal lineup. Then again, Arsenal have a lot of problems right now. I think it will be a uphill battle to make a Champions League spot this season. I hope they prove me wrong. Please wake me up when it's all over!